Interior designer, socialite, writer and bon viveur Nicky Haslam is a regular guest on board the yachts of the great, the good and the merely fabulous. 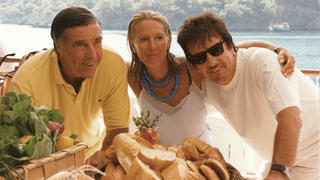 Here he shares his happiest seafaring memories... 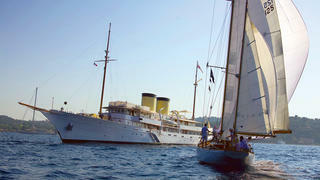 Towards the end of the 1950s, living in St Tropez, we would reel out of Ghislaine’s, one of the world’s first discothèques, to see Stavros Niarchos’s ravishing black-hulled and famously cursed 63 metre sailing yacht Creole (pictured) had sailed in overnight, or Gianni Agnelli’s racers, pencil-slim, scudding away below a million sails and, once, the flamboyant Chilean millionaire Arturo López Willshaw’s fantasy, La Gaviota (now Marala), her décor by Emilio Terry of giraffe-skin-velvet upholstered banquettes, Louis XVI furniture and Ming-potted palms as deliciously, extravagantly impractical then as they would be today. Off Tahiti Plage, we’d lunch on movie producer Sam Spiegel’s Malahne (contemporary of Shemara, on which her then owner, Lady Docker, had got into deep do-do for tearing up the Monagesque flag), with Betty Bacall and Jean Vanderbilt diving, lithe as ribbons, into the sun-splintered sea. Don’t think for a moment I actually went on board these fabled craft, except for Sam Spiegel’s. Rather, just gazed, in mute admiration. Later, for one Aegean-sailed August, friends and I hired a leaky tub that took on water so alarmingly we had to abandon ship with Prince and Princess Michael of Greece’s gleaming white hull handily towering over us. 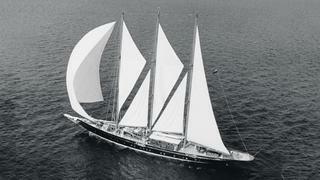 Towards the end of the 1950s, living in St Tropez, we would reel out of Ghislaine’s, one of the world’s first discothèques, to see Stavros Niarchos’s ravishing black-hulled and famously cursed 63 metre sailing yachtCreole (pictured) had sailed in overnight, or Gianni Agnelli’s racers, pencil-slim, scudding away below a million sails and, once, the flamboyant Chilean millionaire Arturo López Willshaw’s fantasy, La Gaviota (now Marala), her décor by Emilio Terry of giraffe-skin-velvet upholstered banquettes, Louis XVI furniture and Ming-potted palms as deliciously, extravagantly impractical then as they would be today. Off Tahiti Plage, we’d lunch on movie producer Sam Spiegel’s Malahne (contemporary of Shemara, on which her then owner, Lady Docker, had got into deep do-do for tearing up the Monagesque flag), with Betty Bacall and Jean Vanderbilt diving, lithe as ribbons, into the sun-splintered sea. Don’t think for a moment I actually went on board these fabled craft, except for Sam Spiegel’s. Rather, just gazed, in mute admiration. Later, for one Aegean-sailed August, friends and I hired a leaky tub that took on water so alarmingly we had to abandon ship with Prince and Princess Michael of Greece’s gleaming white hull handily towering over us. My first experiences of actual grand seafaring were summer weeks spent on newspaper proprietor Seymour Camrose and Joan Aly Khan’s twin-screw ketch, Tartar; loftily flying the White Ensign guaranteed a masthead ballet of dipped burgees, and possibly a welcoming gun-salute, in every port from Salonica to the Costa Smeralda, where Joan’s son, the Aga Kahn, had just unleashed his ocean-going Kalamoun, arrow-sleek and faster than the wind, on unsuspecting co-racers, while his torpedo-slim Shergar gurgled alongside. 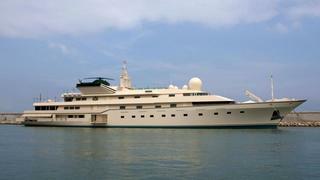 And moored mountain-like nearby was Adnan Khashoggi’s Nabila (now Kingdom 5KR - pictured), the original superyacht, riveting for having an “auxiliary potato-peeler” button in the vast galley and a handful of yawning young, hired to get up and dance when anyone entered the strobe-pulsing onboard nightclub, whether at 9pm or 5am; to say nothing of a bizarre couple named Ricky and Sandra Portanova, who were docked – “parked up” would better indicate their gaudy galleon’s girth – in Monaco. Ricky, no stranger to a tot or two of rum, aroused the ire of Prince Rainier by frequently relieving himself on the steps of the Hotel de Paris, and the banished Portanovas had to high-sail it away to Morocco – “after all, that king lets you pee anywhere”, as Princesse de Polignac astutely commented. My first experiences of actual grand seafaring were summer weeks spent on newspaper proprietor Seymour Camrose and Joan Aly Khan’s twin-screw ketch, Tartar; loftily flying the White Ensign guaranteed a masthead ballet of dipped burgees, and possibly a welcoming gun-salute, in every port from Salonica to the Costa Smeralda, where Joan’s son, the Aga Kahn, had just unleashed his ocean-going Kalamoun, arrow-sleek and faster than the wind, on unsuspecting co-racers, while his torpedo-slim Shergar gurgled alongside. 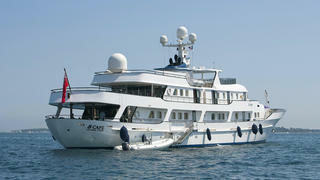 And moored mountain-like nearby was Adnan Khashoggi’s Nabila (now Kingdom 5KR - pictured), the original superyacht, riveting for having an “auxiliary potato-peeler” button in the vast galley and a handful of yawning young, hired to get up and dance when anyone entered the strobe-pulsing onboard nightclub, whether at 9pm or 5am; to say nothing of a bizarre couple named Ricky and Sandra Portanova, who were docked – “parked up” would better indicate their gaudy galleon’s girth – in Monaco. Ricky, no stranger to a tot or two of rum, aroused the ire of Prince Rainier by frequently relieving himself on the steps of the Hotel de Paris, and the banished Portanovas had to high-sail it away to Morocco – “after all, that king lets you pee anywhere”, as Princesse de Polignac astutely commented. 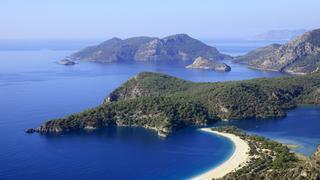 And, as sooner or later everyone must, I discovered the southern shore of Turkey. Initially I drove its length, swerving off treacly tarmac to climb every mountain to ruined arenas, waded out to submerged temples: deep, rippled white marble monoliths more emotive than any museum. And, owing to divine providence, I met premier Turkish hostess Cigdem Simavi, who, with her newspaper proprietor husband Haldun, had recently founded Göcek, now a world-renowned yacht haven. As well as their Halas, a 1914 Clyde-built coastal cruiser, later pressed into service for the Dardanelles campaign, now reincarnated as the last word in maritime luxe for her seasonal stately steam from the Sublime Porte to these calm Carian coastal waters, Cigdem had her own, far more intimate, floating pleasure-dome. Melek was no commonplace gulet but a three-mast schooner, wide-keeled, her only stateroom a seagoing ottoman divan of wide low sofas, soft cushions and furry throws for chillier daybreaks. Somewhere, cheek-by-jowl with bunk-like cabins, was a galley from which Cigdem conjured her exquisite Circassian chicken, or Black Sea turbot grilled over sweet-scented wood, to be lazily relished before a fall into the limpid depths of yet another turquoise bay, while her sons scampered like tanned acrobats up into the rigging. And, as sooner or later everyone must, I discovered the southern shore of Turkey. Initially I drove its length, swerving off treacly tarmac to climb every mountain to ruined arenas, waded out to submerged temples: deep, rippled white marble monoliths more emotive than any museum. And, owing to divine providence, I met premier Turkish hostess Cigdem Simavi, who, with her newspaper proprietor husband Haldun, had recently founded Göcek, now a world-renowned yacht haven. As well as their Halas, a 1914 Clyde-built coastal cruiser, later pressed into service for the Dardanelles campaign, now reincarnated as the last word in maritime luxe for her seasonal stately steam from the Sublime Porte to these calm Carian coastal waters, Cigdem had her own, far more intimate, floating pleasure-dome. Melek was no commonplace gulet but a three-mast schooner, wide-keeled, her only stateroom a seagoing ottoman divan of wide low sofas, soft cushions and furry throws for chillier daybreaks. Somewhere, cheek-by-jowl with bunk-like cabins, was a galley from which Cigdem conjured her exquisite Circassian chicken, or Black Sea turbot grilled over sweet-scented wood, to be lazily relished before a fall into the limpid depths of yet another turquoise bay, while her sons scampered like tanned acrobats up into the rigging. The south Turkish coast was – still is – the most serene to sail along, particularly if one was lucky enough to do so in The Virginian, Anthony and Carole Bamford’s (pictured) magnificent… I hesitate to say, merely, boat, as she is also a kind of Aladdin’s cave of unexpected pleasures. Fancy a firework display tonight? Whoosh, the rockets go up. A zippy tender to whizz you to that legendary kilim dealer? It’s bobbing by the side below. Birthday? Your birthday?? Today??? Cake, candles, crackers and be-ribboned presents for a sun-hatter’s tea party just before dusk. Equally perfect is the Getty family’s magnificent Talitha. The gleaming white and two-yellow-funnelled silhouette of this top classic yacht masks an interior filled with rare maritime art and incunabula found by antique dealer Christopher Gibbs. Victoria, model-trim in a couture rubber diving suit, plunges fearlessly into the violet depth, emerges, towels off and leads the way to a lonely, whitewashed Seljuk basilica shading a far earlier temple’s scattered columns. On leaving Talitha, your tender makes a full circuit of the vessel; above you, the immaculate crew lines the gunwales, saluting. It’s a parting that can’t fail to make one cry. One summer in Corfu, we looked out to sea and Albania had been blotted out by a movie mogul’s monster. Asked aboard, and stepping off the vertiginous gangplank, our salty sore eyes were met with the sight of a three-storey-high, fully equipped gym, with oiled blond bunnies flexing like muscle-bound mermen. Up several stories, along miles of bland wood corridors, we encountered a child, wandering, lost, who whined: “When are we getting on the boat?” After an hour’s tour, we were ushered into a panoramic saloon. At the far end, dressed for an opening at the Met, was Nora Ephron, drinking martinis. Equally perfect is the Getty family’s magnificent Talitha. The gleaming white and two-yellow-funnelled silhouette of this top classic yacht masks an interior filled with rare maritime art and incunabula found by antique dealer Christopher Gibbs. Victoria, model-trim in a couture rubber diving suit, plunges fearlessly into the violet depth, emerges, towels off and leads the way to a lonely, whitewashed Seljuk basilica shading a far earlier temple’s scattered columns. On leaving Talitha, your tender makes a full circuit of the vessel; above you, the immaculate crew lines the gunwales, saluting. It’s a parting that can’t fail to make one cry. One summer in Corfu, we looked out to sea and Albania had been blotted out by a movie mogul’s monster. Asked aboard, and stepping off the vertiginous gangplank, our salty sore eyes were met with the sight of a three-storey-high, fully equipped gym, with oiled blond bunnies flexing like muscle-bound mermen. Up several stories, along miles of bland wood corridors, we encountered a child, wandering, lost, who whined: “When are we getting on the boat?” After an hour’s tour, we were ushered into a panoramic saloon. At the far end, dressed for an opening at the Met, was Nora Ephron, drinking martinis. For the the past two summers I've been on board Omer Koç’s Meserret II. It has streaked out of Bodrum under an inky, star-spangled arc, and one awakens in the lee of an isolated Greek island to a breakfast of sizzling omelettes and plump mangoes with that unique sweet/sour cream. Omer’s Turkish chefs not only make the Lucullan food, they write bestselling cookbooks. Later we will swim ashore, maybe find the one taverna or a strange, slightly sulphurous spring, once bathed in, who knows, by gods. Pale pink wine passes the sleepy afternoon’s sail to a further island, possibly Patmos, a grand dinner up in Chora, entailing much “do we really have to dress?” Well, no. You can stay on board and watch a 1940s movie, ask for another caipirinha, or be massaged by any of the many-skilled crew Meserret II conceals amidships. One, a huge, gentle Russian giant, tells me that “water energises the body”. Surely that’s one good reason we love being at sea. For the the past two summers I've been on board Omer Koç’s Meserret II. It has streaked out of Bodrum under an inky, star-spangled arc, and one awakens in the lee of an isolated Greek island to a breakfast of sizzling omelettes and plump mangoes with that unique sweet/sour cream. Omer’s Turkish chefs not only make the Lucullan food, they write bestselling cookbooks. Later we will swim ashore, maybe find the one taverna or a strange, slightly sulphurous spring, once bathed in, who knows, by gods. Pale pink wine passes the sleepy afternoon’s sail to a further island, possibly Patmos, a grand dinner up in Chora, entailing much “do we really have to dress?” Well, no. You can stay on board and watch a 1940s movie, ask for another caipirinha, or be massaged by any of the many-skilled crew Meserret II conceals amidships. One, a huge, gentle Russian giant, tells me that “water energises the body”. Surely that’s one good reason we love being at sea.